SparkleTeam is the Leader in Green and Sustainable Business Cleaning Services for Palm Beach, Broward and Northern Miami Dade Counties. We believe everyone can do their part in saving the environment. 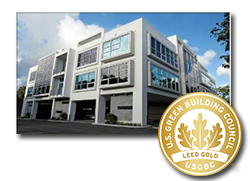 Therefore, all SparkleTeam Service Providers and crew members are trained by specialized LEED consultants to implement USGBC LEED-based cleaning practices to every account serviced. Some of these cleaning practices include use of green certified products, use of micro-fiber tools, and CRI labeled vacuums with HEPA filters for improved indoor air quality. By utilizing a LEED-based green cleaning program in your office or building, the indoor air quality will improve along with a healthier, safer and more enjoyable place to work and visit. Did you know that LEED-based green cleaning is no more expensive than traditional janitorial cleaning services? 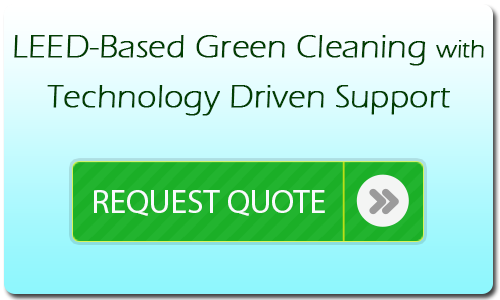 Visit SparkleTeam’s LEED-based Cleaning Program page for more information. SparkleTeam prides itself on offering the most responsive, professional and reliable quality management support in the industry. Utilizing SparkleTeam’s proprietary quality management software, Site Survey Reports (sample on right) are conducted on a monthly basis and are recorded electronically to be immediately sent via e-mail to the Property Manager, SparkleTeam Customer Service and the Service Provider for immediate follow-up. How does this benefit you? By having “eyes and ears” on the property along with a detailed analysis which you can share with others at the click of a button. 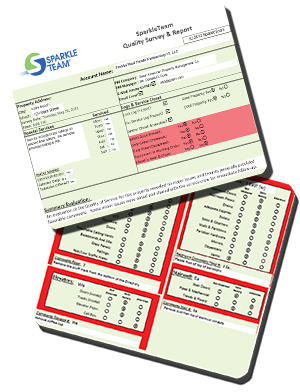 Visit SparkleTeam’s Quality Management page for more information. For over 10 years SparkleTeam has been providing unprecedented business cleaning services to commercial properties all throughout South Florida. Some of the commercial properties include LEED Certified buildings and TOBY Award Winning buildings. With the help and support of the SparkleTeam LEED-based Green Cleaning Program, each of the buildings excelled in categories regarding maintenance and care. Visit LEED Certified Buildings Serviced by SparkleTeam for more information. Visit TOBY Award Winning Buildings Serviced by SparkleTeam for more information.